A Sterilization Validation test confirms the appropriate Sterility Assurance Level (SAL) of the medical device. The testing establishes the pertinent sterilization parameters for health care reprocessing instructions. Based on the data obtained through testing, the manufacturer will be able to provide health care facilities with validated sterilization parameters. Nelson Labs can validate using steam (gravity or prevacuum), ethylene oxide (EO), STERRAD® or dry heat. ANSI/ASMI ST79, ANSI/AAMI ST77, and AAMI TIR12 are guidelines for testing reusable medical devices. Nelson Labs has the equipment and qualified personnel to help guide you through the process. Our experts will provide individualized consultation and are here to help simplify the complex regulatory and standard recommendations. Steam Sterilization Sterility Assurance Level testing: The testing validates the recommended gravity and/or prevacuum steam sterilization parameters for the medical device. Nelson Labs validates individual devices, implants, trays, kits, or other reusable devices. Typically, a Sterility Assurance Level (SAL) of 10-6 is validated using the biological indicator overkill method. Depending on the specific device, other testing such as dry time validations or internal temperature mapping may be appropriate. Dry time testing ensures that after the sterilization cycle, the packaging and device are not wet. Moisture may compromise the sterile properties of the packaged device. Temperature mapping profiles the temperature inside the containment device and demonstrates the heating properties of the device. Nelson Labs validates individual devices, implants, trays, kits, reusable devices, or other devices reprocessed at a health care facility. 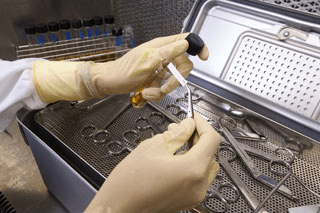 If you have additional questions about Sterilization Validation – Reuse Device testing, or would like to consult with the experts at Nelson Labs, just send us a request or call us at +1 (801) 290-7500.